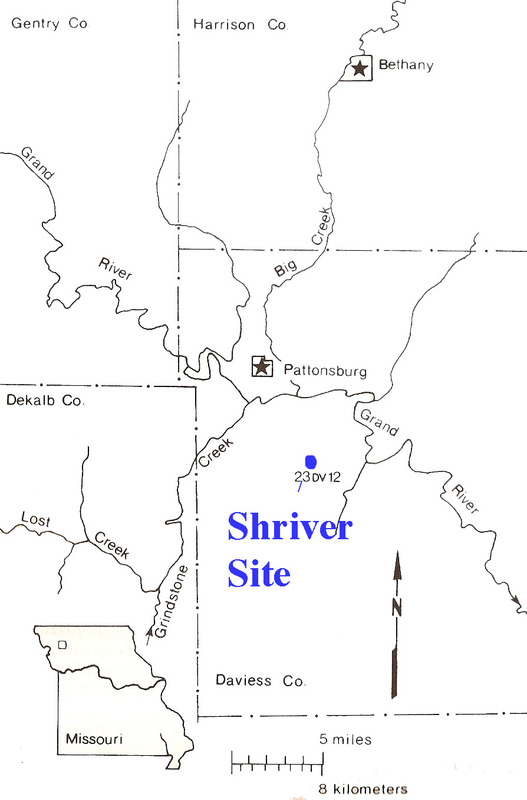 The Shriver Site (23DV12) is a highly significant archaeological site in Missouri that was discovered during the cultural resource mitigation of the construction of Interstate Highway 35 in Daviess County, Missouri. Two excavations (1974 and 1975) documented 3 strata at the site: Woodland (C-14 date of AD 1110 +/- 110), and two Paleo-Indian layers (TL dates of 8690 +/- 1000 BC and 12,855 +/- 1500 BC). 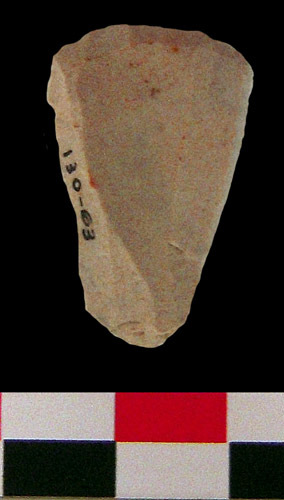 A fluted point was discovered in the upper Paleo-Indian layer while the lower stratum contained numerous tools, but no diagnostic projectile points. 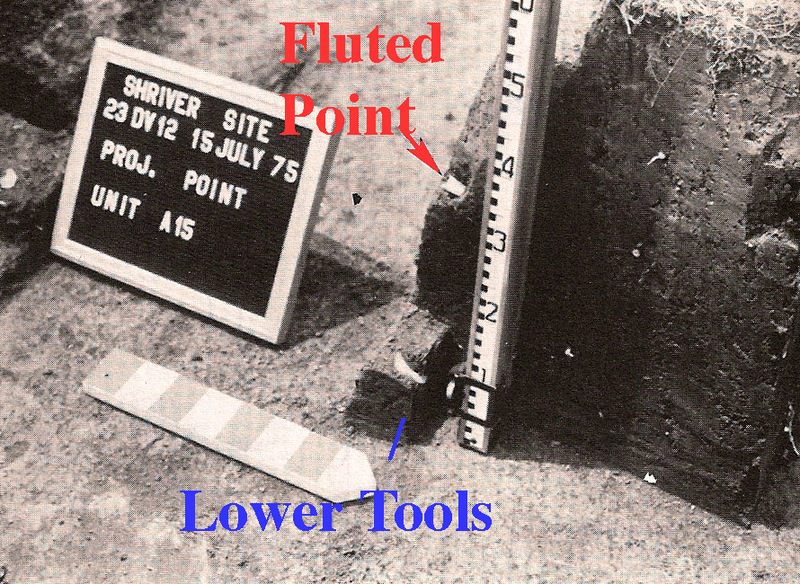 Line drawing (Reagan 1981: Figure 2a) and digital photograph of the fluted point from the Shriver Site. The fluted point measures 25.9 mm in length, 18.7 mm in width and 4 mm in thickness. It original length can be estimated as 45 mm. It weighs 2.7 grams was manufactured from a Pale Brown (10YR6/3) chert with small black specks that are microfossils (possibly formaniferia). The base of the point is ground and lateral grinding extends 16 mm along the blade. 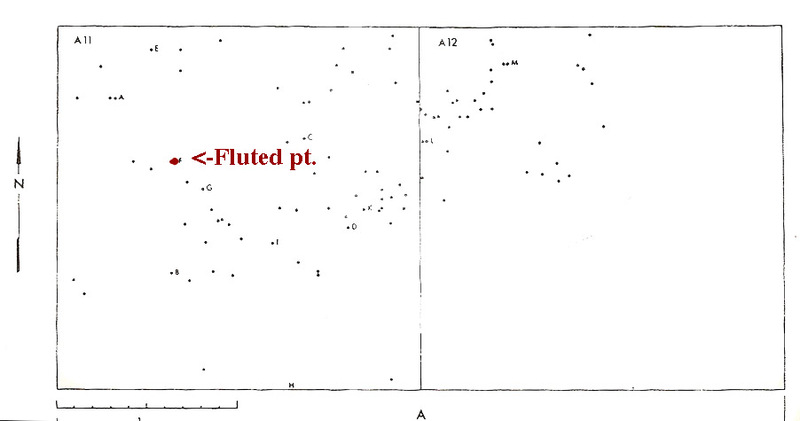 O'Brien and Wood (1992:Figure 2.4, 38) identified the fluted point as a small Clovis point. The point shares some characteristics with the Cumberland point type which Morrow (1984:14) reports as extremely rare in Iowa. Hayes (2002:54) suggested that the fluted point is an eastern variant of the Folsom point; specifically the variant called a Sedgwick Point. 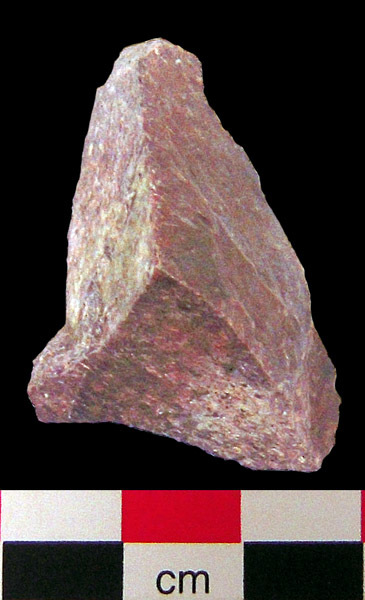 End scraper from pink chert (5YR7/3) that measures 29.5 mm in length, 17.9 mm in width, and 3.9 mm in thickness. It weighs 2.6 grams. It was previously published by Reagan et al. (1978: Figure 2D). 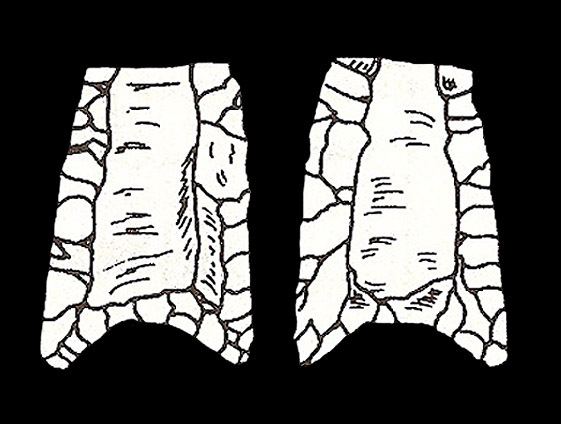 End scraper from very pale brown chert (10YR8/3) that measures 32.3 mm in length, 35.2 mm in width, and 10.0 mm in thickness. It weighs 11.5 grams. It was previously published by Reagan et al (1978: Figure 2B) and Rowlett (1981: 2B). 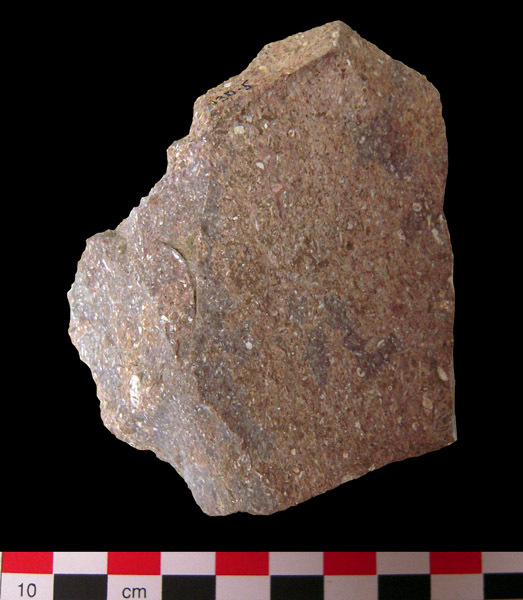 Back Knife from pale red chert (10R6/3) that measures 34.7 mm in length, 18.6 mm in width, and 4.9 mm in thickness. It weighs 4.2 grams. The excavation context of this artifact is from Lithic (ie. 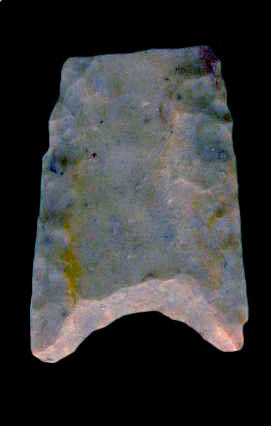 pre-Fluted point) assemblage; specifically it is artifact 130-10. It was previously published by Reagan et al (1978: Figure 2BH) and Rowlett (1981: 2D). O'Brien and Wood (1992:38-39) attribute the artifacts from the deepest deposts as "naturally flaked" and not the result of human manufacture. The geomorphic setting of the site makes this explanation difficult to support. Several archaeological reports published after O'Brien and Wood's criticism have treated the deepest deposits as the result of human activity. Blade tool from gray chert (5YR5/1) with pinkish gray mottling (5YR7/2) and a very pale brown (10YR7/4) cortex. It measures 61.7 mm in length, 31.8 mm in width, and 9 mm in thickness. It weighs 14.9 grams. 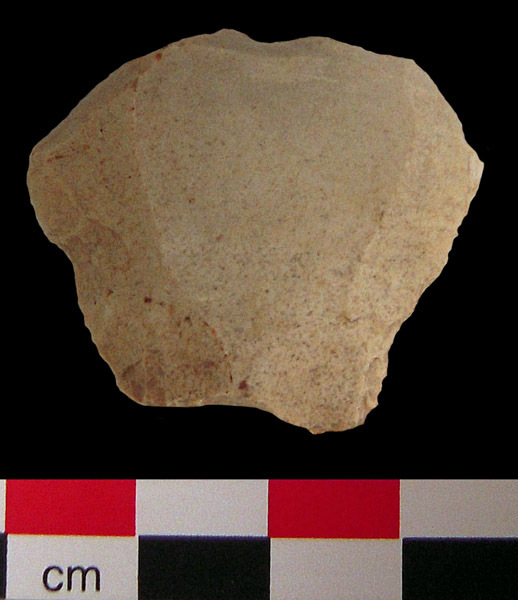 The excavation context of this artifact is from the pre-Fluted point layer. Flake with a burinated facet from light brownish gray chert (10YR6/2). It measures 25.9 mm in length, 24.8 mm in width, and 2.8 mm in thickness. It weighs 1.9 grams. 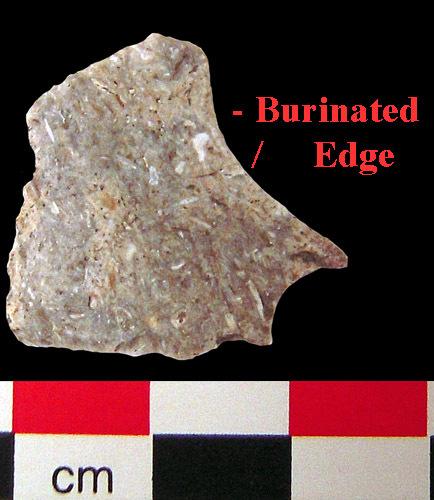 The excavation context of this artifact is from the pre-Fluted point layer. Core out of pale red chert (10R6/2). It measures 78.8 mm in length, 68 mm in width, and 30.3 mm in thickness. It weighs 172.7 grams. The excavation context of this artifact (specimen no. 130-5) is from the pre-Fluted point layer. Pyramidal shaped scraper that measures 36.7 mm in length, 27.8 mm in width, and 17.7 mm in thickness. It weighs 10.9 grams. The excavation context of this artifact is from Lithic (ie. 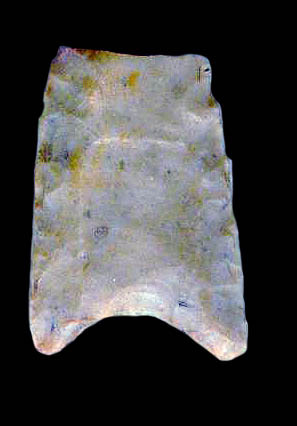 pre-Fluted point) assemblage; specifically it is artifact 130-27. 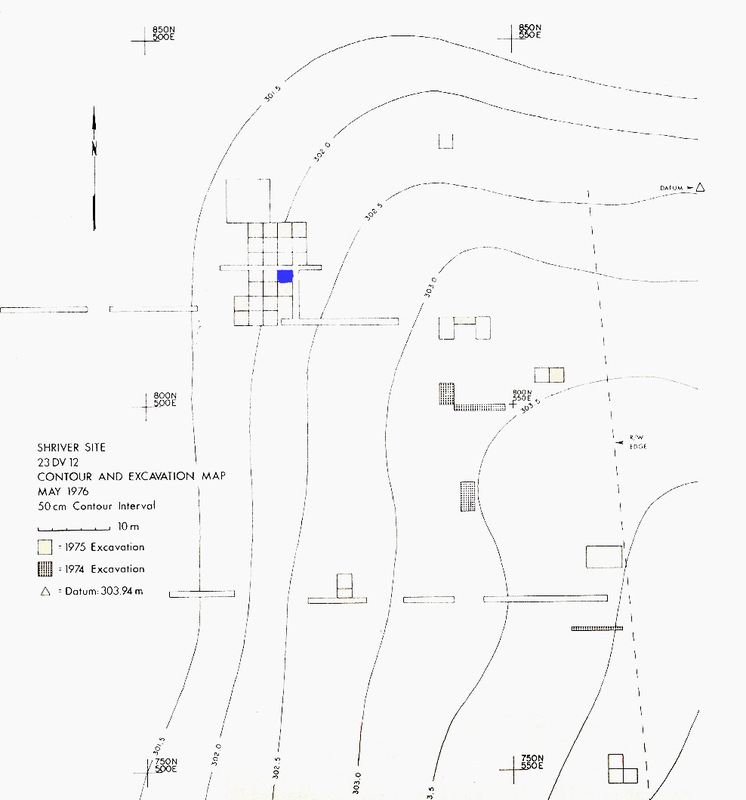 Plan of the Shriver Site's location. The excavation shaded in blue is the location where the fluted point was discovered. 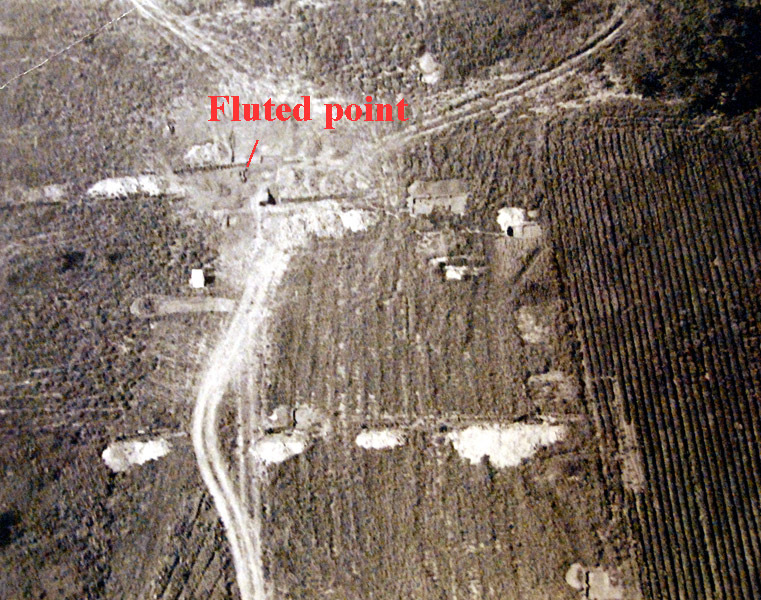 Aerial photograph of the site during 1975 excavation season showing the location where the fluted point was discovered. In situ photograph of the Fluted Point and deeper deposits at the Shriver Site. Distribution of the fluted point and other artifacts in excavation units A11 and A12. Each excavation unit measured 2 x 2 meters in size. Plot of artifact distribution in excavation units A11 and A12 . 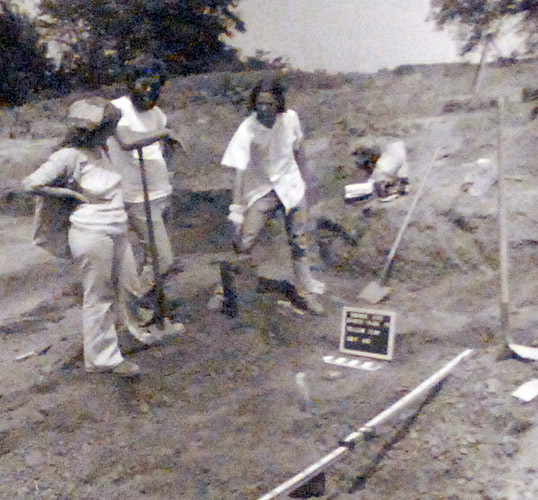 Mary Oman, Michael Reagan and Wallace B. Thoreson at the excavation. Michael Reagan served as the Field director for the excavation while David Evans (Archaeological Survey of Missouri - UMC) served as the Principal Investigator. Missouri Dept. of Transportation contact print. 1993 Vegetational changes at the Shriver Paleo-Indian site, NW Missouri: Phytolith analysis as an aid in environmental reconstruction. MASCA: Current Research in Phytolith Analysis: Applications in archaeology and paleoecology.10: 73-94. 2003 Techniques in Archaeological Geology. Springer. 2002 The Early Settlement of North America: the Clovis Era. Cambridge University Press. 1984 Iowa Projectile Points. 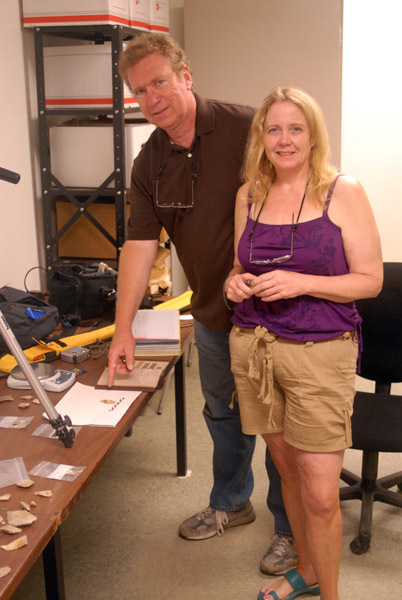 Office of State Archaeologist, University of Iowa, Iowa City. 1998 The Prehistory of Missouri. University of Missouri Press, Colubmia. 1981 A Lithic Assemblage Stratified beneath a Fluted Point Horizon in Northwest Missouri. Missouri Archaeologist 42: 7-16. 1982 Estimating original assemblage content to adjust for post-depositional vertical artifact movement. World Archaeology 14(1):73-83. Thanks to John Eastman (Missouri Department of Transportation) for providing access and assistance in the study of the Shriver Site artifacts. Warm thanks to Neathery Fuller for taking the best digital images and videotaping the research with the collection. Special thanks to Professor Ralph Rowlett (Emeritus University of Missouri - Columbia) for answering my hundreds of questions about the Shriver Site. Many smiles to Ettus Hiatt for her help with text and content editing. It would be a great pleasure to receive an email from Michael Reagan or Mary Oman! Professors Michael Fuller and Neathery Fuller studying the Shriver Artifacts.